SCORE’s latest infographic shows the financing challenges of female entrepreneurs. This infographic highlights the findings of part 2 of SCORE’s “The Megaphone of Main Street: Women’s Entrepreneurship” data report. SCORE surveyed more than 20,000 business owners at all points of the business lifecycle: pre-start, startup, in-business and transitioning. 62% of women entrepreneurs depend on their business as their primary source of income, versus 69% of male entrepreneurs. 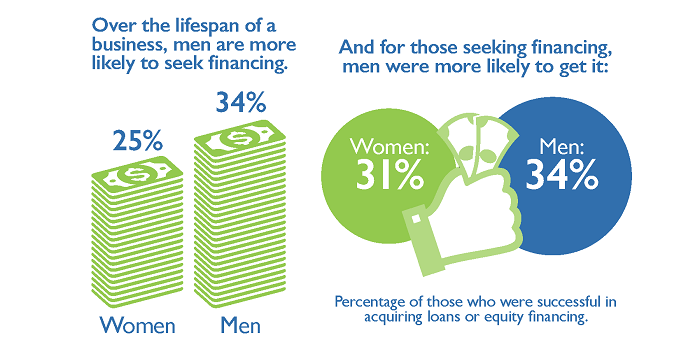 Over the lifespan of a business, men are more likely to seek financing (34%, versus 25% of women). And for those seeking financing in the past year, men were more likely to get loans or equity financing than women (38%, versus 31% of women). Male and female entrepreneurs sought financing for similar reasons related to starting or growing their business, with the exception of one: Men were more likely than women to seek financing for the purpose of launching a new product (26%, versus 22%). The most popular funding sources for business owners across genders included non-SBA loans, personal savings and credit cards (with more women relying on credit cards than men).